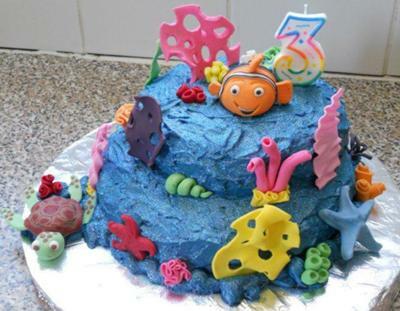 I made this Nemo cake for my little Jade for her 3rd birthday. I used the spongecake premix from Value Baking Supplies which is really easy and straight forward to use. For the blue "water" icing, I made butter icing and sprinkled edible glitter over to give it the shiny look. All the decor I made myself, using "plastic icing". It takes patience but at least you can start over if you are not happy with the decor as you can just remold it while still soft. I really enjoyed making these as it is like playing with playough. Jade absolutely loved her Nemo cake and couldn't wait to take a bite!